CHURCHILL'S LIFELONG LOVE OF DRINKING Much is said of Winston Churchill's drinking habits. It is acknowledged, by himself and others, he had a great fondness for drink. Whether he was an alcoholic or not is still up for debate, but his passion for spirits is not. He was so fond of alcohol that it added greatly to his debt and at one time he owed his wine merchant the equivalent of $75,000. 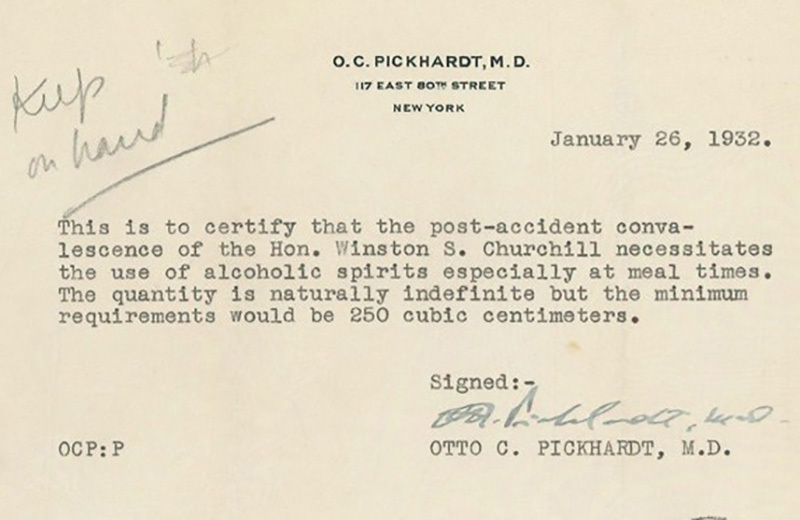 His doctor even wrote him a prescription for alcohol when he visited the United States during Prohibition. Originally a brandy and soda drinker, Churchill took to drinking scotch as a young man in India and South Africa, "The water being unfit to drink, one had to add whisky and, by dint of careful application I learned to like it." As a result his daily tipple was a nip of Johnnie Walker Red with a goodly amount of water, something his children called a "Papa Cocktail". 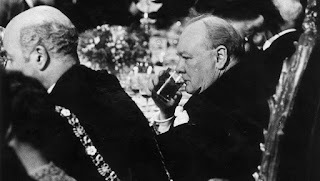 Churchill also enjoyed Plymouth gin, though he did not personally care for vermouth, thus the Churchill Martini is basically a glass of cold gin. I would like to observe the vermouth from across the room while I drink my martini. 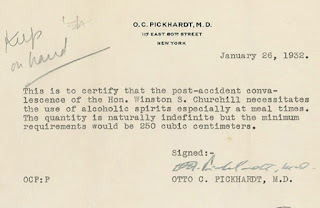 ~ Winston Churchill REGARDING THE CHURCHILL COCKTAIL The recipe was first printed in Esquire in September 1939, nine months before Churchill became Prime Minister. 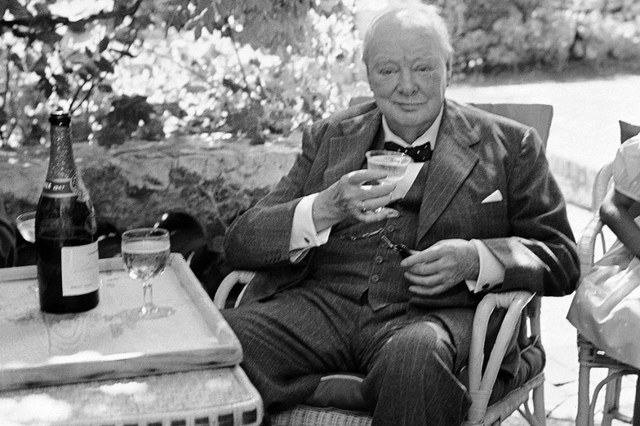 Created at the American Bar in the Savoy hotel in London by bartender Joe Gilmore in honor of Winston Churchill, the Churchill Cocktail is a scotch variation of a Manhattan (traditionally made with rye whiskey), or like a Rob Roy with the addition of lime juice and Cointreau. 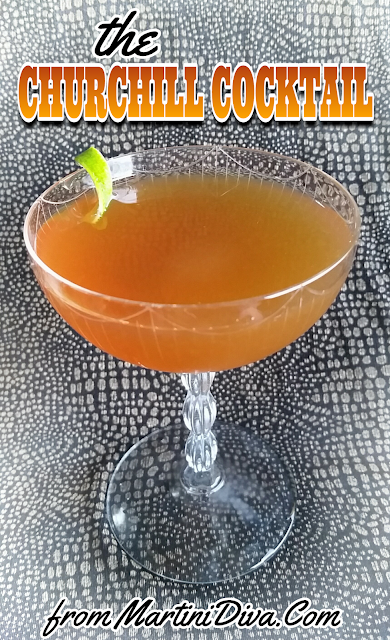 It a fairly citrus forward drink with a bit of smokiness from the scotch. 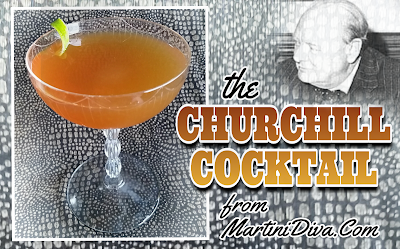 There is no mention whether Churchill ever enjoyed this particular drink, even though he was a patron of the American Bar throughout most of his life.